Turbo is a racing game and the first Colecovision title to support the Expansion Module #2. It requires four C batteries and took the form of a steering wheel and a foot pedal that acts as an accelerator / brake. The expansion even includes an area to store your Colecovision controller so you can use it to change gears! 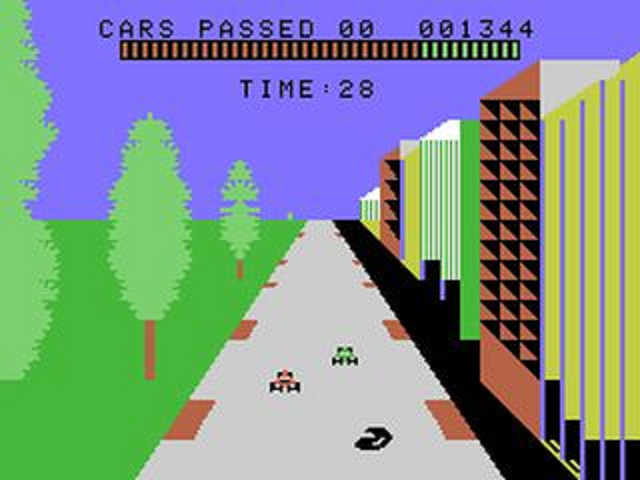 There are four different skill levels and your objective is to pass a certain number of cars before the time limit runs out; your current status is indicated by the red/green bar at the top of the screen and if you finish in the latter coloured area your score increases and you continue racing. It might sound like a generic game that has limited scope but thankfully the developers added changing backgrounds and track surfaces. For example, one minute you'll be driving on city streets, then racing alongside a bending cliff-side before trying to keep traction in the snow. Even a day-night system has been implemented to keep things interesting. The controls are very responsive and any concerns I had about the steering wheel sensitivity were quickly alleviated. The sense of speed is fantastic and the great collision detection makes it fun zooming along while trying to avoid the vehicles and oil slicks that litter the roads. A minor criticism is that the background transitions are quite jarring and you'll sometimes crash due to this quick shift in scenery. However, the action is very addictive and you'll want to keep playing to see what's up ahead. The graphics aren't anything special but they do a good job of conveying the many different environments that the game has to offer. Turbo is a brilliant racing game for the Colecovision and one that has aged incredibly well. While it does require the Expansion Module #2 it's definitely worth purchasing the add-on as it's an experience you cannot fully enjoy via an emulator. Random trivia: This version of Turbo is a port of the 1981 Arcade original; an Atari 2600 port was in development but unfortunately it was cancelled prior to its release.